We recently bought a brand new Dell vostro for our Lab. We were looking to install a copy of Linux on the new PC. The price was good, the monitor is super. All in all a very good deal. Thank you Mr Dell. So far so good you might be thinking…..
As Adam was taking the PC out of the box he noticed a rattle – not a good sign with a brand new PC. What could it be? A loose screw – not good, could short something. Was it a chip? Not good – that would mean some problems with the build process. What could it be? Take a look at these pictures. I took the pics with a pen to give some idea of scale. We have all seen small stuff before, a mammoth needs some reference point, and boy this is a biggie – lol. What a monster, how could this have happened? You will see that there are 4 screws, some sort of glue in the middle area and according to Adam there is also a clip to hold everything together. I just cant believe this. So what has happened to the DELL quality assurance process? Have they gone the way of Ryan Air? (By this I mean that the customer service is in the price.) No wonder the price is so low, if they send the components to you for self assembly. We would not mind the self assembly bit – but what damage has this monster done to the insides of our brand new computer? 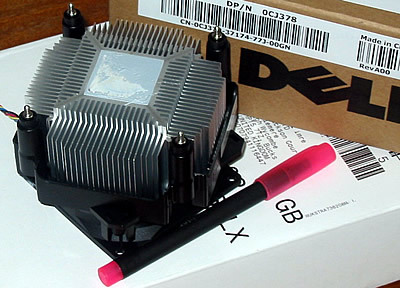 For me the shock was the size of the heatsink. In a past life I used to install PC’s and occasionally I would have to fix them. Yes – I know this was a few years ago. 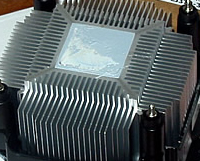 But back then you got a PC that had a heatsink. 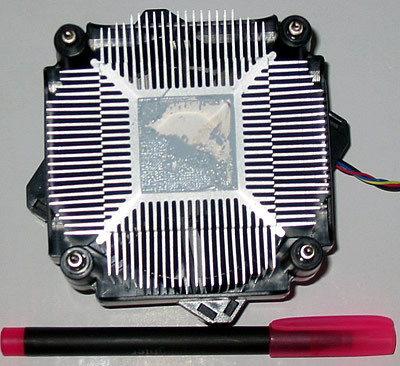 Now you buy a heatsink and the PC comes with it !!! Stone the crows. I just had a thought – if we apply Moore’s law…. can you imagine the size of the cooling requirements? We will be back to computers of 20 years ago that used to fill a room. Except the computer bit will be the size of your DNA and the cooling part will be the size of the room. How funny! Dell were super, it took a couple of calls and a few apologies…… the new unit arrived and the old one was collected. No hassle. (Ryanair and dabs could learn from this! Would we buy from DELL again? Yes. Would we recommend them? Yes. So there you go, customer service still matters.